According to the American Academy of Orthopaedic Surgeons (AAOS), more than 2.5 million Americans had undergone some form of hip replacement surgery by 2014. Although traditionally associated with older adults aged 65 and older, the number of younger adults undergoing hip arthroscopy has been increasing in recent years. Statistics show that as many as 10% of candidates for the procedure are now under the age of 50. Lara Spencer, a host on Good Morning America, recently revealed that she underwent a total hip replacement at the age of 47. Why are Younger Adults Getting Hip Replacement Surgery? “In my head, I’m 27, so I really waited for a long time before I did anything about it, or told anybody because it sounds like it’s an old person’s problem, and I just couldn’t believe it,” said Spencer. While joint problems and degeneration associated with problems like osteoarthritis are more common with advanced age, everyone is susceptible to damage from a number of sources like traumatic injuries, wear and tear over time and genetic factors. Active adults who exercise regularly and maintain a healthy weight are generally not who come to mind when thinking about a prosthetic joint replacement. However, Ms. Spencer leads an athletic lifestyle, with a background in competitive diving and recreational tennis. While it may seem counterintuitive, more and more orthopedic surgeons are treating patients that fit Ms. Spencer’s profile, namely young, active, and otherwise healthy adults. Spencer admitted to suffering from chronic pain, and to a genetic predisposition to joint deterioration, which is most likely the primary underlying cause of her hip condition. Like many younger and middle-aged adults, she admits to having put off hip treatment, which often makes the problem worse when it comes to joint degeneration and orthopedic injuries. Following her treatment, Ms. Spencer is giving away her cane to one lucky viewer in need of assistance. 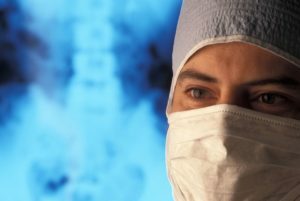 What is the Difference Between Total and Partial Hip Replacement Surgery? The most common reason that people suffer problems is through the progressive damage from arthritis. Arthritis is one of the most common conditions of aging and affects millions of Americans each year. Other factors like genetics and heredity, and trauma from an injury can increase the risk of developing arthritis. The hip is one of the most complex joints in the body and can be restored with a partial or total hip replacement depending on the extent and cause of the hip damage. A partial replacement (also known as a hemiarthroplasty) is performed to replace a damaged femoral head, or the ball portion of the socket (the hip is what is known as a ball and joint socket). The damaged bone, cartilage, and tissue is removed and replaced with a prosthetic. With this procedure, the remaining healthy portion of the hip joint is left intact. In a total hip replacement procedure, the socket portion of the joint (acetabulum) is also replaced. This is the most common treatment for bone disease and degeneration, which tends to affect both the ball and socket, making it necessary to replace both. Partial hip replacement is appropriate when a fracture only affects one part of the joint. Most people who undergo surgery have been living with chronic pain for months or years, and have had limited or insignificant results from more conservative treatments like rest, medication, and physical therapy. Pain can disrupt a person’s overall quality of life and even lead to additional health problems, disrupting the ability to eat, exercise, and sleep. For active people like Lara Spencer who suffer from chronic pain, hip surgery can both restore eventual mobility and functionality to the hip, as well as improve the overall quality of life by relieving the pain caused by the damaged joint. The duration and intensity of the rehabilitation and recovery process varies from patient to patient, but generally, involves three to six months of physical therapy and strength training exercises. How Young is Too Young For Joint Replacement Surgery? As Lara Spencer pointed out in discussing her condition and upcoming surgery, even young, healthy, and physically fit adults can suffer from chronic hip pain and joint problems resulting from trauma, joint degeneration, or genetics. People, particularly women, in their 40s and 50s are increasingly undergoing some form of artificial joint replacement procedure. Rather than focusing solely on age, Dr. Steven Meier recommends monitoring symptoms and seeking treatment as soon as possible for any symptoms that persist for more than a few weeks, and do not respond to conservative treatment methods like rest and over the counter medication. Orthopedic injuries in childhood and early adulthood can sometimes lead to arthritis years or even decades after the initial hip injury, increasing the risk of joint damage and deterioration. If you are suffering from chronic hip pain and problems with movement and mobility, contact Meier Orthopedic Sports and Regenerative Medicine by calling 310.777.7845 or filling out our online contact form to schedule a consultation today. Next, read When Should You Consider Hip Surgery?